Homeopathic medicines are prescribed according to a natural law known as the Law of Similars. Sometimes expressed as “like cures like,” this law allows Homeopaths to correct symptoms of ill-health with substances that produce similar symptoms when tested on a healthy person. The following three examples will more clearly demonstrate this law, the way it works, and how it is applied. Coffee has a powerful effect on the body. The first time a person drinks a strong cup of coffee, they will experience one or more of the following symptoms: racing thoughts, palpitations, increased urine production; shaking hands, excitability, and restlessness. If that person drinks it before bedtime, difficulty in sleeping can be added to the list. While coffee produces these symptoms in a healthy person, the Law of Similars dictates that it should be able to relieve similar symptoms in the unwell – and this is exactly what it does. A child, brought to a homeopath with hyperactivity, agitated thoughts, and sweaty, trembling hands, might receive a homeopathic preparation of coffee (called Coffea Cruda). It would relieve and correct their symptoms. Another person seeking homeopathic treatment for insomnia caused by racing thoughts and the frequent need to urinate, might also be prescribed Coffea cruda. Their racing thoughts and urine production would settle, allowing them to easily fall asleep. Once again, coffee can relieve in the unwell the very symptoms it produces in the healthy. It is important to note that not every symptom associated with a substance has to be present before homeopathic treatment can begin. As shown in the two coffee stories, just some of the symptoms are enough. Example 2: Stimulants for the Over-stimulated. Without realising it, conventional medicine sometimes uses the Law of Similars for its drug effects. Two examples of this are Dexamphetamine and Methylphenidate hydrochloride, better known as Ritalin. Both medications are stimulants but both are the frontline treatments for hyperactivity disorder. Conventionally, it has never been explained why stimulants should calm an already over-stimulated child, but this is exactly what happens. Homeopaths simply acknowledge that it is another case of ‘like treating like’. Ritalin and Dexamphetamine are useful treatments for hyperactivity because they produce the very symptoms they treat. The only catch is that they, and any other conventional medicine used according to the Law of Similars, will produce toxic side effects. Homeopathic remedies are free of this problem. Example 3: Onions – Enough to Make You Cry! The humble onion can also help explain the Law of Similars. Because of its vapours, most people struggle with watery eyes and a running nose when slicing onion. If these symptoms occur during an episode of hay fever, a dose of Allium cepa, the homeopathic preparation of red onion, will relieve them (see Hayfever Case for further illustration). What the onion can produce in the healthy, it will treat in the unwell. The name, ‘Homeopathy’, is formed from two Greek words that define its mode of action: homeos, meaning similar and pathos, meaning suffering. Thus, Homeopathy treats with substances that produce effects similar to the suffering. Homeopaths generally refer to this as “like cures like”. Abi had a bout of hayfever. Her eyes and nose were streaming and she could not stop sneezing. Her nostrils and upper lip were raw and sore from the discharge. Bright lights made her eyes sting and water even more. Abi also found the stuffiness of rooms unbearable, and felt much better in the cool open air. 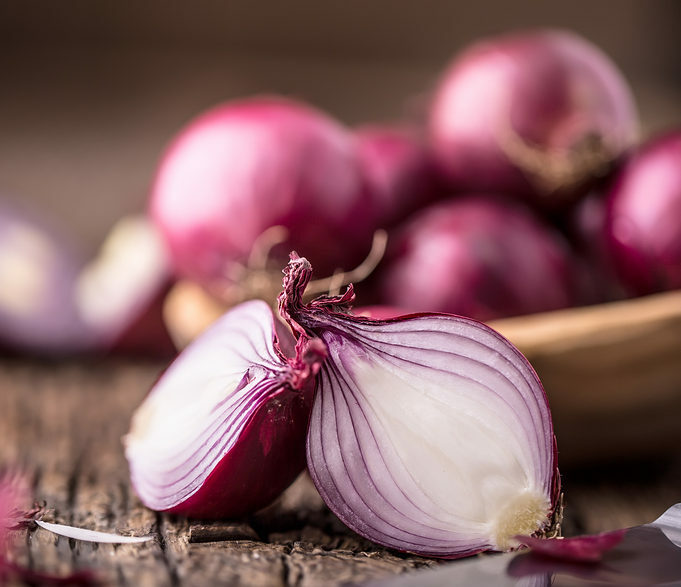 Her first dose of Allium cepa, the homeopathic preparation of Red Onion, substantially relieved her symptoms within five minutes – she no longer had to carry a box of tissues. Two hours and three doses later, Abi’s hayfever symptoms were completely resolved. Note: Allium cepa will not treat all forms of hay fever; only those types where symptoms mimic an exposure to onion. Allium cepa symptoms, confirmed by homeopathic trials on the healthy, consist of burning watery eyes that are irritated by bright light; watery nasal discharge that scalds the nostril or upper lip, especially the left; frequent sneezing; intolerance to stuffy environments, and improvement of symptoms in open air. Hay fevers with different symptoms will need other remedies. Tutorial 9 – Palliation, Supression or Cure?